This Crispy Creamy Avocado Chicken Bacon Wrap is a twist on Avocado Toast. My guacamole with it’s surprise ingredient is what brings it all together. And it also has bacon! Who doesn’t love bacon? I’m sure there are a few people out there who don’t, but please don’t comment! This is a fairly quick recipe to put together if you already have cooked chicken and tortillas on hand. It would be great for lunch or dinner with a side salad. Very filling! 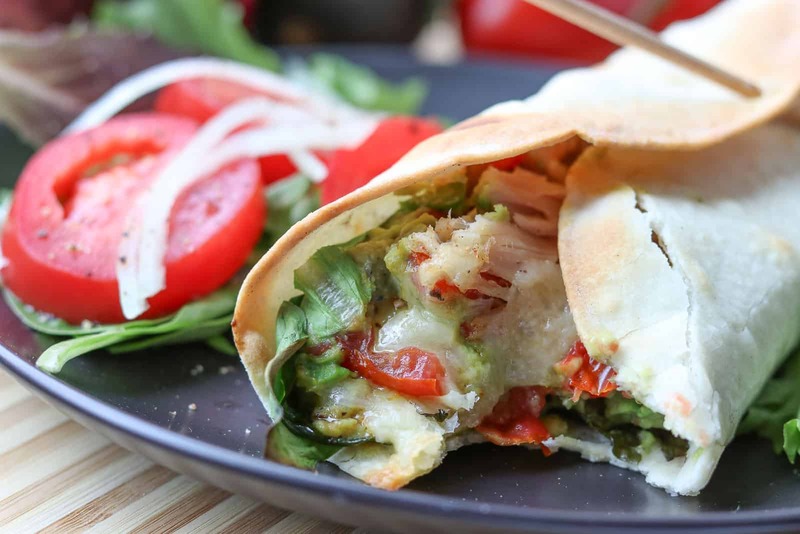 Delicious crispy wrap with creamy, cheesy, bacon, avocado and chicken inside! And it’s healthy for you! What could be better? 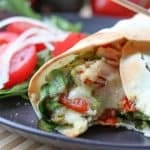 Except that it’s a bit hard to say, “Crispy Creamy Avocado Chicken Bacon Wrap!” But oh so delicious! First make the guacamole. Cut the avocado in half and scoop it out into a small bowl. Mash slightly then add the tomatoes, garlic, jalapeño, onions and sherry. Combine with a fork. Add in the bacon crumbles. Warm tortillas slightly in microwave for 20 seconds if needed- sometimes you have to soften them up a bit so you can roll the wraps more easily. On each wrap, arrange a few leaves of lettuce then spread 1/4 avocado mixture, then add 1 oz chicken, and 1 T. shredded cheese. Roll up each wrap and secure with a toothpick if desired. If you want them crispy, spray each wrap with a bit of oil and place on a cookie sheet and broil it for a minute or so until crispy or place in your air fryer and heat until crispy (mine is a Breville Smart Oven Air and takes about 3 minutes on 350°. Serve immediately. The guacamole turns brown if left out too long. 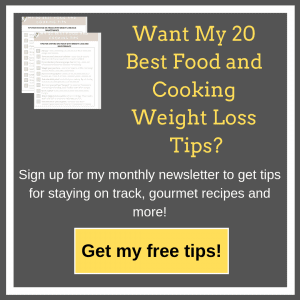 If you’re looking for just the guacamole recipe, click here! If you want to make only 2 wraps, the best way to keep 1/2 avocado from turning brown in the refrigerator is to use a Food Saver and seal it up. It will stay green and fresh for a few days. No Replies to "Crispy Creamy Avocado Chicken Bacon Wrap"